According to the flat earth map Antarctica is a ring surrounding the flat earth and the sun is revolving above the flat earth but inside the circle. So, on a flat earth, viewed from Antarctica, or any point south of the Tropic of Capricorn, the sun can only ever appear to the North. Flat earthers accept the midnight sun, where the sun appears above the horizon for days on end, which occurs in northerly regions as the sun rotates around the Tropic of Cancer. 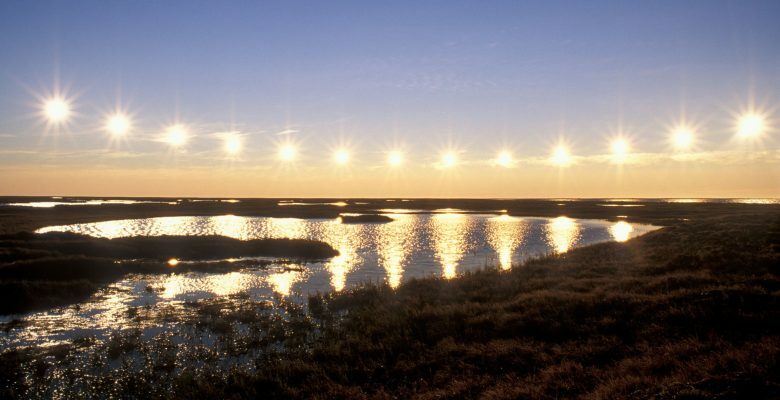 They also accept the long night that occurs in Antarctica at the same time but they argue that this midnight sun phenomenon can not occur in the southern regions and Antarctica. This is completely incorrect. I have personally traveled to the southernmost part of South America during the longest day of the year and have seen with my eyes the sun rotating around in the sky almost 300 degrees. At that location, 54 degrees south, the sun still sets for a few hours. But it sets in the south and rises again also in the south and makes it journey around the sky to the north and back into the south to set again. This behavior of the sun can be observed by anyone south of the Tropic of Capricorn and it absolutely proves the flat earth map is incorrect. There is no need to travel all the way to Antarctica to refute or confirm this. Even at 54 degrees south you can very clearly see the sun in the sky and you can also see the where the sun is when it is below the horizon during the long twilight period after it sets and before it rises. That only leaves about three hours when it is dark. And then the the sun rises again on the southerly side a little east from where it set a few hours before. I will discuss my personal experience with this in another post. Conclusion: Flat earthers are incorrect. The midnight sun phenomenon does occur in Antarctica in the same way as it does in the Northern regions. This proves the flat earth map is incorrect and is what we would expect to occur if the earth was a globe. Flat earth: Are Australia to South America flights real? JJ on Flat earth: Are Australia to South America flights real? no on Flat earth: Are Australia to South America flights real? Copyright © 2019 Flat Earth Facts. All Rights Reserved.